Wilfrid Laurier University Professor Hind Al-Abadleh, of the Department of Chemistry and Biochemistry, has been named 2018/19 Fulbright Canada Research Chair in Climate Change, Air Quality, and Atmospheric Chemistry from Wilfrid Laurier University to University of California, Irvine (UCI). Al-Abadleh, an air pollution expert, will be at UCI, in Orange County, from the beginning of January to the end of April 2019. The prestigious Fulbright Scholar Program allows for top and highly promising scholars from around the world to spend time at academic institutions in the United States. Al-Abadleh will be going to one of the world’s top centres for air-quality research, where the late Sherwood Rowland led the discovery of the fact that chlorofluorocarbons contribute to the hole in the ozone layer – work that would earn him a Nobel Prize. Not only will Al-Abadleh have a chance to work with top atmospheric chemists from UCI, she will have opportunities to network with others from the extensive, multi-campus University of California system. She will also have access to state-of-the-art research equipment and facilities. 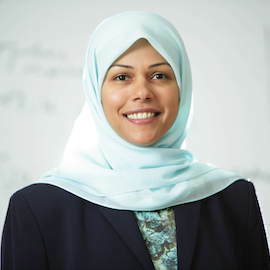 Al-Abadleh will teach a graduate special topics course on environmental heterogeneous chemistry, based on a course she has taught at Laurier since 2006, and will likely give guest lectures at UCI and other California universities. Most of her time, however, will be devoted to fundamental scientific research on the chemistry of air pollution, especially ground-level ozone and inhalable nanoparticles. Ground-level ozone, a major component of smog, has significant negative effects on human health as well as on vegetation. It is produced when volatile organic compounds, which can be natural or industrial, react with nitrogen oxides, which are primarily produced by the burning of fossil fuels. More ground-level ozone forms when temperatures are high, which means climate change is worsening smog. Nanoparticles, which are too small to be caught by standard industrial measures to mitigate emissions, can come from a variety of sources. They can affect human health when they are breathed in and get lodged in the lungs and circulatory system, causing inflammation and disease. Nanoparticles also affect plants and animals. Another area of Al-Abadleh’s research has to do with how solid surfaces interact with polluted air. Being in California will give Al-Abadleh an opportunity to do research in different climatic and atmospheric conditions, with sea spray in the air and a mix of industries unlike Ontario’s. Al-Abadleh won Faculty Association Merit Awards at Laurier in 2012, 2016 and 2018. She has been the recipient of several research grants through the Natural Sciences and Engineering Research Council of Canada (NSERC) as well as research awards from Imperial Oil and a Young Innovator Award from Petro-Canada, and the Early Researcher Award by Ontario's Ministry of Research and Innovation (2011-2016), as well as a Women Who Inspire Award (for professional excellence) by the Kitchener-Waterloo Coalition of Muslim Women (2017), among many other awards. Al-Abadleh has co-authored several dozen peer-reviewed studies that have appeared in high-impact journals. For more information about the Fulbright scholarship and other 2018/19 Laurier recipients, read the Laurier news release.